I have wanted to visit Cruicetown for a long time, ever since I saw images of the ringed cross, it's just a pity there was bad light during my visit. 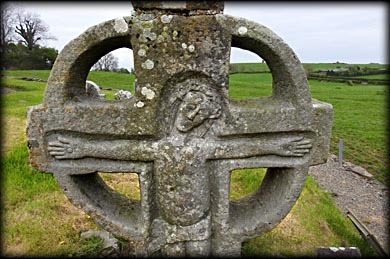 The sandstone cross stands 2.23 metres high and bears carvings in false relief on the East and West Faces. 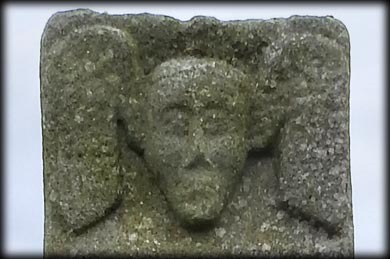 A simple crucifixion covers the west face, with a winged head at the top. 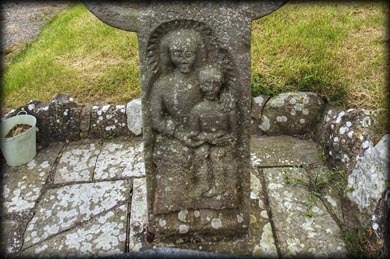 There is a Madonna and Child is carved on the lower shaft of the east face and another winged head at the top. 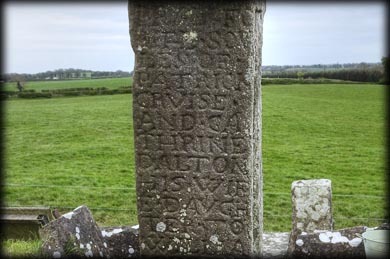 An inscription on the northside of the cross reads: "Pray for the soules of Patrick Cruise and Catherine Dalton, his wife, Daughter to William Dalton of Milton, and Elizabeth Dalton, his wife, whoe had this made and ----- An. Dom. 1688." Situated: From Kells head NE on the N52 after 4.8 kilometres, take a slight left for Nobber. After 3.9 K turn left onto Deerpark Heights. The Church and Cross are 1.7 K down here on your left. Discovery Map 35. N 7947 8454. Last visit April 2017.